It is time to start thinking about summer vacations, and a Puerto Rico vacation is a wonderful tropical experience anyone can enjoy. So many believe that Puerto Rico is a destination that can’t be afforded, but in fact it is more and more reasonable. Not only am I sharing some must-do items for your Puerto Rico vacation, but also some great ways to make it easier to manage! Do you crave the mountains for skiing or the beach for rest and relaxation. This Chicago born girl prefers the beach in a heart beat. So where can you travel without needing a passport but still feel like you are in somewhere tropical? 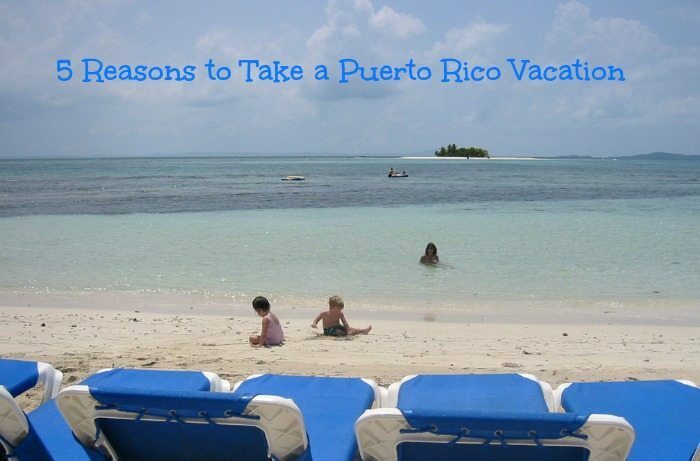 A Puerto Rico vacation is the ideal destination for everyone! Have you thought of taking a Puerto Rico Vacation? Our family has been to Puerto Rico a few times, once when I was a kid for a cruise stop and another 10 years ago when my husband had a conference. So, we know our stuff when it comes to visiting this great island destination. Whether you are planning a couples getaway or a family vacation, Puerto Rico has great adventures in store for you! Did you know these facts about Puerto Rico and 5 reasons to take a Puerto Rico vacation? 1. Puerto Rico is featured in the Top 10 Beaches from Travel Channel: With 270 miles of coastline, it is no surprise that it was featured in this ultimate list of beaches to visit. Included in this feature is Flamenco Beach in Culebra, often cited as one of the best beaches in the world. 3. Old World charm of San Juan. A Puerto Rico vacation isn’t complete without a visit to San Juan. Historical landmark and beautiful city, you will find a family friendly fort to explore plus museums, restaurants and fun shops. Bring comfortable walking shoes for this part of your trip as there will be a lot of walking, but it is well worth your time spent. 4.Outdoor exploration adventures. Adventurers can enjoy horse back riding or the magnificent Camuy caverns that runs through the 3rd largest subterranean river in the world. Our kids were too young to do this when we went but it looks so amazing. Not to mention the gorgeous beaches and deep sea fishing experiences, it is ideal for the sportsman. 5. A Foodie Dream Come True. If you enjoy eating fun new cuisine a Puerto Rico vacation is a great experience. Foodies can experience the delicacies of Puerto Rican gastronomy and it’s famous Rums. Food and beverage experiences here are amazing! If this has not tempted you yet to plan a Puerot Rico vacation, remember that Puerto Rico does not require any passports or foreign money so you can book a trip there last minute with no worries or expense of expediting passports. Why would you like to visit Puerto Rico? This post is brought to you from Puerto Rico Tourism, all opinions are 100% my own. Our cruise ship stopped in Puerto Rico; however, it wasn’t long enough to really see anything. I hope to go back one day – but not in the middle of a hot, humid summer. I have never been to Puerto Rico but would love to visit their beautiful beaches! I have always wanted to visit Puerto Rico, and you definitely gave me some good reasons to plan a trip! I would love to visit Puerto Rico. If I can ever get my hubby to fly I want to go to Puerto Rico with him. 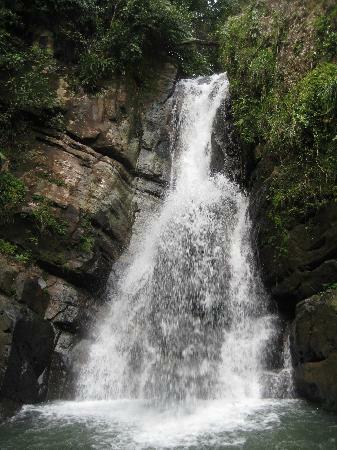 I would love to hike in a Rain Forest and breath in all the clean air and see how much fun I could have in Puerto Rico! I want to see the wonderful sites of Puerto Rico! It looks like so much fun to go to the gorgeous beach! It looks so beautiful. I would enjoy going to Puerto Rico for a relaxing vacay. Oh, this is beautiful! Next vacation destination for sure! Beautiful! Puerto Rico is a dream destination of ours. This looks like such a cool place to go to! My husband lived there when he was younger and he has talked about going back to visit. I have always dreamed of visiting Puerto Rico! The scenery is amazing! I’ve been to Puerto Rico, but not to some of the places you mentioned. My friends and I did horseback riding on the beach in Isabella-miles of rainforest and secluded beach. Gorgeous. Puerto Rico is an amazing place to take a vacation and try out the restaurants and beaches! The Waterfall is gorgeous and I like how warm it is for a Winter vacation. I would like to see the rainforest at El Yunque because I have never seen one. It seems beautiful, I have never been out of the country and am always in awe of how beautiful the countrysides are in other places. I would love to visit Puerto Rico. It looks absolutely gorgeous and seem like it would be fun.